In addition to the Main Camp programs, Badger Camp offers a Primitive Camp. Primitive Camp programs offer a variety of choices from horseback riding, canoeing, and much more. They are limited to 12 campers per session and are guided by 2-5 experienced staff members. Both Primitive Camp and the Travel Program are designed for those looking for a unique and somewhat more challenging experience. Looking for a new kind of Primitive Camp adventure? Come check out our brand new Eco Explorers program! The week will offer outdoor fun and environmentally focused programming for campers. This session will integrate art, science, nature, gardening, cooking, drama, and music into the Primitive Camp experience as we explore new ways to connect with nature. 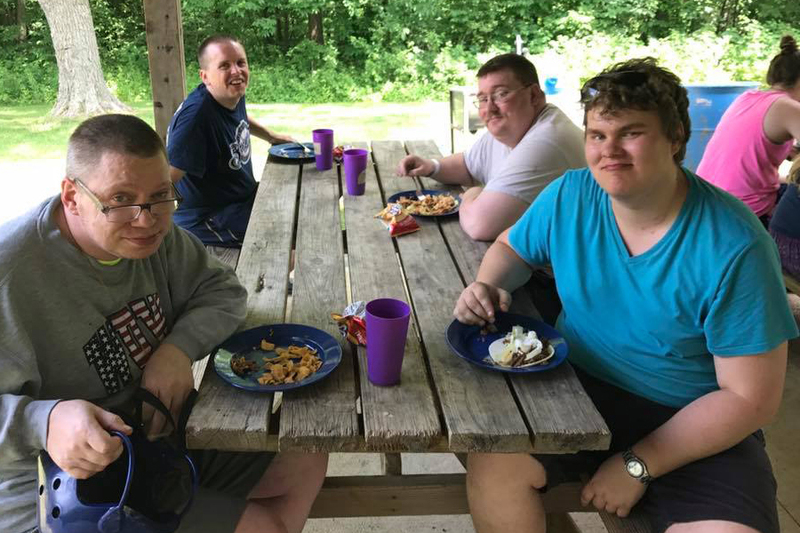 Campers will also be taking a trip to Wyalusing State Park to explore some of the beauty that the Driftless Region has to offer. Fee is $800. Calling all cowboys and cowgirls! Giddy-up on over to Primitive Camp where you’ll get to pass the time by playing horseshoes, learning to lasso, and create your own leather crafted journal. Enjoy western-style meals over the campfire as you learn the tunes that the cowboys and girls used to sing into the night. Saddle up the chuck wagon for the Hoe Down (Badger Ball) because you’ll also be creating a group line dance to teach to the other campers. This session also includes swimming, fishing and plenty of crafts! Fee $800. During this week you can participate in exciting activities like horseback riding, canoeing, and hiking! Along with other special activities that take place throughout the week, you will get to go fishing, swimming and do crafts, music and much more! No prior riding or canoeing experience is required. Fee is $900. Unleash the super sleuth in you! Come explore Badger Camp with your detective hat on as we learn how to explore the outdoors with metal detectors and other fun equipment while finding answers to hidden clues by going geo caching. We’ll also uncover the mad scientist in each of us while performing nature based science experiments as well as getting a little messy as we learn about chemical reactions! Fee is $800. If you love the outdoors AND the arts, this is the program for you! Join us for our third annual Storytellers and Music Makers session to create an original Badger Camp production that will be recorded and posted to our YouTube channel and website as well as the Friday Talent Show for all of camp to see! You’ll be able to work with our Music/Drama Director to create a set, script and music for this one-of-a kind-performance. This session also includes fishing, swimming and of course, Badger Ball! Fee is $800. See our Facilities page for map to our Summer Badger Camp location.